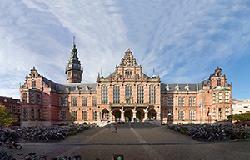 The University of Groningen has a long academic tradition extending back to 1614, which makes Groningen the oldest university in the Netherlands after Leiden. The university takes the 74th place in the Times Higher Educational World University Rankings of 2015-2016. The University of Groningen has a special connection with the energy sector. Not only is it situated on top of the Groningen gas field, but it also has close ties with the parties developing this field. Currently, the University of Groningen and companies like Gasunie are cooperating in several energy related organisations such as the Energy Delta Institute and Energy Valley. Energy raises key scientific and social challenges. The University of Groningen has made energy one of its three main research themes and makes major contributions to the transition to sustainable production and consumption of energy. The Groningen Energy and Sustainability Programme, GESP, is the platform for all University of Groningen research and teaching on energy and sustainability. GESP unites research and teaching in this field within the university and facilitates cooperation with other knowledge institutes (including the Energy Academy Europe), government bodies, the business world and social/public organizations. Within the faculty of law the Groningen Centre of Energy Law coordinates all research involving (parts of) the energy sector. Its research covers the entire energy chain (“from well to burner tip”). It includes all legislation and regulation applying to the production, transmission and supply of energy, the promotion of renewable energy sources, the need to secure energy supply as well as issues concerning climate change and environmental protection. Current research is to a large extent focusing on the liberalization of the EU and national energy markets as well as its legal, economic and social consequences. Other areas of interest are the contractual framework within which the energy suppliers and consumers operate as well as the fiscal and financial aspects of energy production and supply. The energy sector is developing from a national to an international industry as a result of which cross-border issues are becoming increasingly important. As of the 1960s the Netherlands is exporting natural gas to several European countries but is also an important transit state for several other energy resources like oil. Due to a steadily decreasing supply and an increasing demand, the need to import energy will expand. This will also have an impact on the legal framework within which the energy markets operate. International and comparative law is therefore one of the key research areas of the Groningen Centre of Energy Law. As the economic and cultural capital of the region, the city enjoys a bustling reputation, while retaining its’ safe community character. What will probably strike you most when entering Groningen is its youthful population. Roughly a quarter of the city’s 193.000 inhabitants are students. You will find them everywhere, studying in the park, riding a bike, or having a drink with fellow students in one of the many pubs. With the city’s many bars, restaurants, theatres, museums and sports facilities, you will never be bored. But if you do feel like leaving the vibrant city life, the countryside is never far away. Take a breath of air and clear your head while enjoying the flat landscape and limitless view in all directions when you get nearer to the ‘Wadden Sea’. For more information on the city and university please see the website of the university. 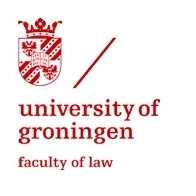 Academic coordinator: Dr Martha M. Roggenkamp, professor of Energy Law, director Groningen Centre of Energy Law, Faculty of Law, University of Groningen. The Faculty of Law in Oslo is the oldest and largest educational and research institution within the field of law in Norway. The Faculty of Law in Oslo educates approximately 75% of all new legal candidates in Norway, and is the work- and studyplace for around 300 employees and 4 300 students. We are divided into six Departments/Centres in addition to the Administration. The larger part of the Faculty is situated in the classical University buildings in the centre of Oslo. In addition to the traditional fields of study within law, our researchers also explore more modern aspects of law – such as Environmental Law and eCommerce. The faculty also holds a Department of Criminology and Sociology of Law and a Centre fo r Human Rights. Doctoral training at the faculty is a priority, and the number of completed doctoral degrees is increasing. Interdisciplinary research groupsare used to enhance the quality and scope of the research. The faculty’s academic staff play a significant role in Norwegian society. They are sought after as members and leaders in the public councils and committees, especially in legal comitees and arbitration chairs. The Institute is internationally renowned for its expertise in Maritime, Offshore, Petroleum and Energy Law. It hosts the Faculty’s Centre for European Law and research groups in Natural Resources Law and International Law of Contract. The Institute has an international profile, with students, staff and associates from all over the world. We offer an LLM in Maritime Law and different courses in English. It is possible to stay at the institute as a guest researcher for a short or long term; our staff publish articles and books in English. We arrange seminars in English and our staff participate in seminars and projects world wide. The professional sphere with the employees range from maritime law (transport) and insurance law, to petroleum and energy law. The Institute was established in 1963. Organisationally we are connected to both the University of Oslo and the Nordic Council of Ministers. For more information please see the institute’s website. Founded in 1495 by William Elphinstone, Bishop of Aberdeen and Chancellor of Scotland, Aberdeen is Scotland’s third oldest university, and the fifth most ancient in the whole United Kingdom. Much of the original King’s College still stands today, a famous historic landmark beloved of generations of students, academics, and local people who are, inspired by the finest examples of medieval and Renaissance craftwork remaining anywhere in Scotland. Over the centuries our graduates and scholars have changed the world in many fields of human endeavour. Their legacy and inspiration lives on today in our wide-ranging museum collections, and in our uniquely-rich historic collections and archives, available to a wide audience in our new University library. The Centre for Energy Law is a Research Centre within the School of Law of the University of Aberdeen created in order to promote the research activities of the many members of the School having an interest in Energy Law matters, as well as fostering an environment for collaborative work. The Centre is supported by the University of Aberdeen’s College of Arts and Social Sciences. We enjoy the benefit of being located within the University of Aberdeen, an institution with a proven track record of carrying out research across the whole spectrum of the energy sector. This broad research base greatly enhances our capacity for carrying out multi- and inter-disciplinary research. The University is itself located within the unofficial energy capital of Europe, and maintains significant links with industry and policy-makers. Aberdeen is Scotland’s third largest city — a place with historic charm, a thriving economy and cosmopolitan community of some 220,000 people. A coastline of spectacular beaches and dunes stretch north of the city, while to the west lies nearby Royal Deeside, home to some of the most beautiful countryside in Scotland and the eastern gateway to the mountainous Cairngorms National Park. With a student population of over 40,000, Aberdeen caters for all cultural, leisure and entertainment tastes. His Majesty’s Theatre, The Music Hall, Aberdeen Exhibition and Conference Centre, and The Lemon Tree regularly attract national and international artists and companies. The city also boasts three cinema multiplexes, Aberdeen Art Gallery, a Maritime Museum and first-class sports facilities. 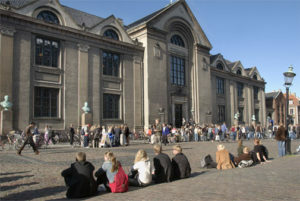 With over 37,000 students and more than 7,000 employees, the University of Copenhagen is the largest institution of research and education in Denmark. The purpose of the University – to quote the University Statute – is to ‘conduct research and provide further education to the highest academic level’. Approximately one hundred different institutes, departments, laboratories, centres, museums, etc., form the nucleus of the University, where professors, lecturers and other academic staff, as well as most of the technical and administrative personnel, carry out their daily work, and where teaching takes place. These activities take place in various environments ranging from the plant world of the Botanical Gardens, through high-technology laboratories and auditoriums, to the historic buildings and lecture rooms of Frue Plads and other locations. Fundamentally, the Faculty of Law works towards creating greater knowledge of national and international law. Traditionally, the legal research has been focused on the study of Danish law, but concurrently with the internationalisation the faculty has adapted its research. Today, the researchers are also highly involved in the interaction between Danish law and other legal orders. The Faculty of Law was among the four original faculties at the founding of the University of Copenhagen in 1479. Ever since the faculty has educated skilled graduates for a broad and diverse labour market. Through a research-based education the faculty ensures today that the legal graduates have the skills to analyse and contribute to interdisciplinary and problem-oriented skills in both the private and the public sectors at home and abroad.The faculty adds importance to a proactive dialogue with the outside world. Among others, this is achieved through a large number of conferences and seminars, where faculty researchers make their skills available. A large number of part-time lecturers, who have their main occupation outside the university, also strengthen the proactive dialogue. A dialogue, which also contributes to the students’ understanding of their opportunities after studying. The Faculty of Law is constantly improving and upgrading the education of future lawyers and ensures that they stand strong on the future labour market. Therefore, both research and education are in touch with reality, and the focus is on constantly creating good and valuable co-operation with public and private institutions. The Faculty of Law employs approx. 75 members of the academic staff, some 40 PhD students and about 70 members of the administrative staff. There are also around 400 part-time lecturers. On the legal programmes there are about 4,500 students. Denmark has a population of 5.5 million people. Copenhagen is the Capital of Denmark and the largest city with an urban population of 1,181,239 (2010) and a metropolitan population of 1,894,521 (2010). Copenhagen is situated on the islands of Zealand (Sjælland) and Amager. It is said that Copenhagen is a major regional centre of culture, business, media, and science. Life science, information technology and shipping are important sectors and research & development plays a major role in the city’s economy. Since the turn of the millennium, Copenhagen has seen a strong urban and cultural development and has been described as a boom town. This is partly due to massive investment in cultural facilities as well as infrastructure and a new wave of successful designers, chefs and architects.